Born and raised in Texas, I grew up on Tex Mex and BBQ. Texas BBQ is nothing like Vinegary Carolina Pork BBQ, or Sweet Kansas BBQ, in Texas Beef is king. Especially Brisket. I can honestly say I have never BBQ-ed a brisket myself before. It takes somewhere between 6-8 hours. My Grandaddy though he would cook us a brisket every time there was a family gathering. It always came out tender, juicy and just short of divine. He even had this BBQ sauce made with coke in it. My Great Grandmother used to make black eyed peas from the garden, then my grandmother, great aunt and my mom would spend the day cooking and making everything from potato salad, to fresh rolls, and baked beans. My mom used to slow cook brisket for 4-6 hours in the oven for holidays, thanksgiving and christmas when I lived at home in high school and college. But there is nothing quiet like a BBQ-ed brisket. Travis and I lived in Central Texas for 4 years, and I am here to tell you the BBQ is awesome. 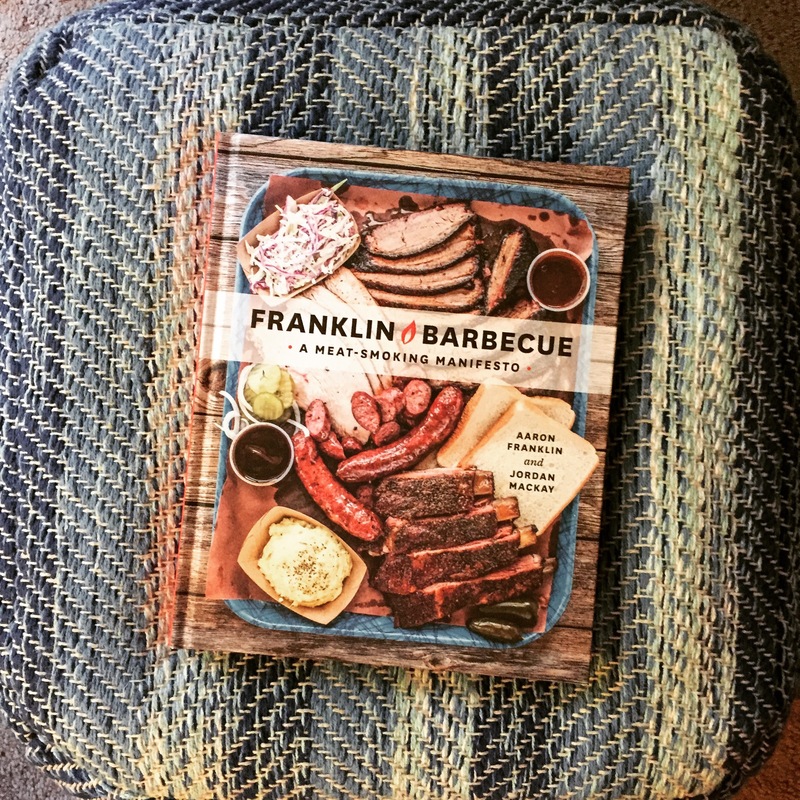 In the book Franklin BBQ Meat Manifesto, Franklin describes his hardships in learning and overcoming to now being one of the premier Central Texas BBQ joints in Austin. Everything from his BBQ roots, the food truck to their location in Austin, he guides readers through the history of Texas BBQ and his tips for learning to create amazing Texas BBQ. This is not a this is exactly how to make the perfect tender BBQ brisket the first time around. This is a learning process, and create your own unique flavor and taste. If you have any desire to learn how to cook Central Texas BBQ brisket, this is the best manifesto out there. Need a smoker, pit or bbq? Franklin gives you the details on how to build and convert your own. Don’t understand how to choose wood for your pit? Franklin gives you the down low on Central Texas woods and understanding the smoke from your pit. What about trimming a brisket? Franklin guides readers into understanding that brisket is a fatty and hard to cook cut and how trimming and proper cook times make it the center piece of Texas BBQ. How do you know when your Brisket is done? Franklin gives you the the cook times, internal temps and his own personal way of checking for doneness. How to cut a cooked brisket? (VERY IMPORTANT) Franklin gives you images and direction. Enough about Brisket, there is also information on choosing & cooking pork ribs, beef ribs, turkey, pork sausage as well as potato salad, coleslaw, and bbq sauces. Franklin is honest in saying that sides and sauces are more of an after thought to BBQ lovers. This is a heavy hard back book with awesome thick pages and full color images. This is not a dainty book, it makes a statement. No dust cover to worry about and recipes are easy to read, each step is in a larger size, red and italicized. BBQ recipes span several spreads but include images and detailed information so you can understand how and why your doing each step. Since Father’s day is around the corner, I would say this would be a great Father’s day gift but honestly it is a great book for anyone, young or old, male or female that loves to cook and wants to learn to BBQ. I’m not into gender typing who BBQ’s. Now, if only I had a pit to cook on. If he likes to grill/bbq or wants to it really is a fabulous book. My husband is dying to get us a house so he can cook the brisket for us!